We are up in Port Orly – a beautiful anchorage on northeastern Espritu Santo Island about 30 miles north of our previous anchorage, Oyster Island. Before we left Oyster Island we spent a day in Luganville (the main town in Espirito Santo) trying to prepare ourselves for the next leg of the trip. 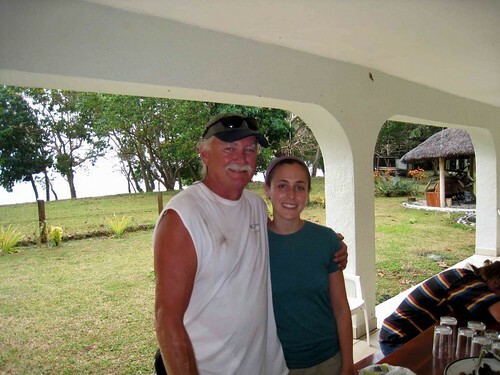 We wanted to extend our visa – which expires September 9th – and had been told that we could do so in Luganville – but the authorities there said we could not extend it yet. They said it was too soon to renew it and that we should just come back in a few weeks. They don’t understand how difficult it is to just “come back” to Luganville with the sailboat after we leave to sail north. We tried our best to talk them into renewing it, but the supervisor was just not interested in helping us out, so we will see how things go over the next few weeks. 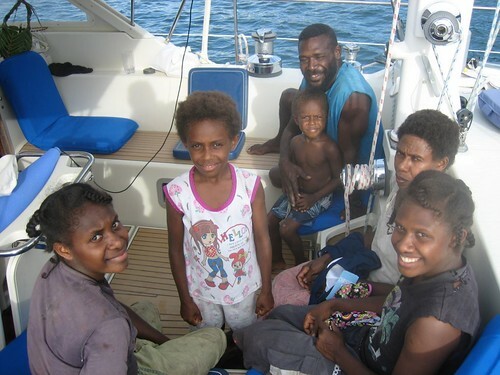 We plan to sail north to the “Banks” – a set of islands in the far north of Vanuatu (about 50-60 miles from where we are now) – and then start working our way back south again. 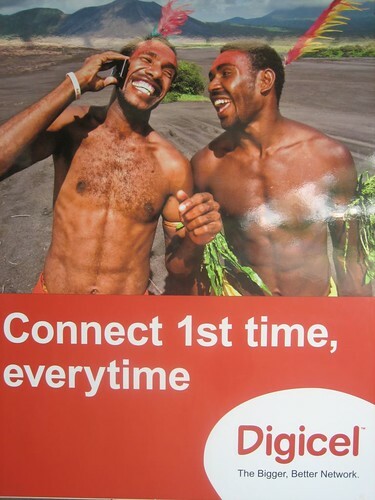 We may have to stop back in Luganville to extend our visa, or we may go all the way south to Port Vila to do it. Anyways, it was an interesting day in town. 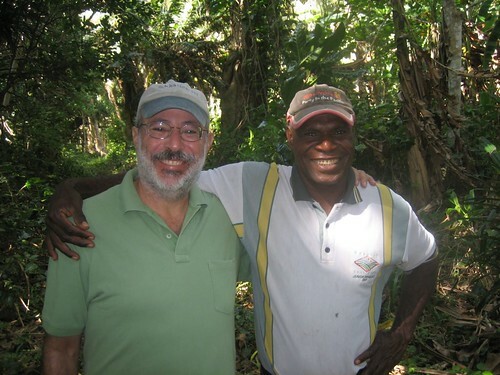 We drove there with Joseph, a chief in the little village near the Oyster Bay Resort. He has a nice pick-up truck that accomodated the 7 fuel cans we brought with us as well as all the fruits, vegetables and food that we bought while we were in town. It was an all day affair to do our shopping, but well worth it, as we have re-stocked on all the important things we need for the next few weeks. We even found apples which was a big treat – there are just so many bananas a person can eat! On Monday, after 10 days in Oyster Bay, we left – heading out of the shallow pass at hight tide with just a foot of water under the keel again – and sailed up to Port Orly. This is a very beautiful spot – and we were very excited to find our good friends from Intiaq here. They have already been up to the Banks and were headed south again – and we were fortunate enough to rendezvous here for a few days. 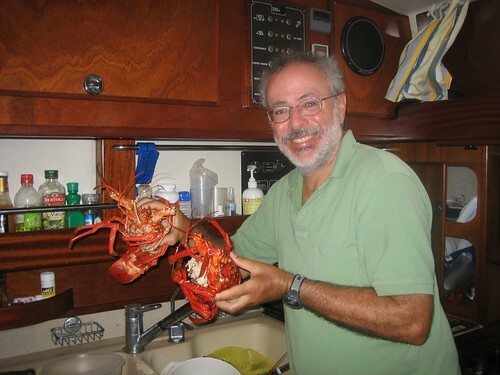 It is always a gourmet affair with Karin and Jean Francois as she is an amazing cook and always invites us for terrific meals onboard their boat. They are a lot of fun. There are 3 other boats in the bay as well – 1 Australian (Flame), 1 New Zealand (Kaitorete), and one Swiss (Miami). We know them all from meeting them in other anchorages over the past few weeks. The two kids onboard Kaitorete know Hannah and talk about her all the time. We had some lovely weather the past few days, but today it is grey and rainy and it is expected to stay that way for a while. It has been 5 days already since Hannah left (we miss her!) and we are still in Peterson Bay anchored outside Oyster Island Resort. When Hannah left we had a couple days of terrible weather – grey skies and too much wind . Then it calmed down and the sun came out again. What a difference weather makes around here. We were extraordinarily lucky with weather during Hannah’s visit – lots of sunshine, not too much wind, and a few cloudy days – but nothing extreme. We had planned to go to town yesterday ( Friday) to renew our Vanuatu visa, but as we got in the cab the driver told us that all the government offices would be closed that day for International Children’s Day. We decided to wait until Monday to go to town – it is a half an hour drive from here and we will just go in once, re-provision, get our visa renewal, and hopefully head north on Tuesday. Oyster Bay has been a nice spot to hang out. The most interesting and beautiful thing we have discovered here are the “blue holes” . These are deep pools formed from underground freshwater springs that carve themselves over time into expansive swimming holes over the underlying limestone rock. The color of the water ranges from an aquamarine to a deep velvety blue – and they are terrific to swim in . There are two blue holes with rivers that run into our anchorage, and both involve about an hour of kayaking each way. The rivers are very narrow and shallow – too shallow to go up at low tide even. They are lined with rich dense foliage , including some huge banyan trees, and when you kayak quietly you hear dozens of different birds. We have enjoyed the blue holes so much that we have already made 5 or 6 trips up and down them. Tomorrow we are going to treat ourselves to a big Sunday brunch at the resort! That will be a nice change from the Special K we have been eating every morning of the trip to date. 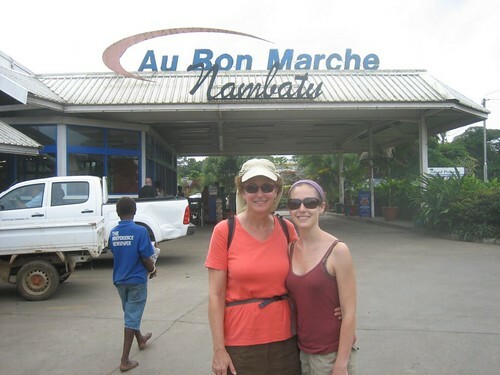 Hannah and Laura in front of the Au Bon Marche Nambatu, the best supermarket in Port Vila. Nambatu refers to radar station number two of the US Navy during WWII. On our first full day in Loltong, the enchanted-looking bay with encircling green hills, we went ashore with the two other boats in the bay, Midnight Sun and Sorcery, both from New Zealand. After a quick jaunt to see the village chief, Richard, we got back in our dinghies and zoomed over to the far end of the bay to a neighboring village. Unlike others we have visited in Vanuatu, this village was built way up on a hill. As we huffed and puffed and schvitzed our way up, a few school children, heading back to school from lunch break, offered to show us the way there. The school was up on the top of the hill, with beautiful views and a much appreciated breeze. There we met two Ozzie volunteer schoolteachers who showed us around the place. Although they’d only arrived two weeks before, they already seemed jaded about the way the school was being run and their ability to make much headway. It’s got to be difficult to get kids engaged when the former schoolteacher had a habit of writing lessons up on the board in the morning for the kids to copy down, and then calling it a day. As the new teachers put it, school starts whenever the kids arrive, and it ends, well, when they leave. The kids do enjoy school, however, and often stick around until 6 or later in the evening. After watching all the kids do warmups on their sports field, Mom, Dad and I split off from the other couples and did a short walk up a forested footpath leading out of the village. Along the way, we ran into various ni-Vans– chopping kava, carrying massive bundles of banana plants, two very elderly ladies watching little naked toddlers. We spent the rest of the day swimming and kayaking, and enjoying our scenic little cove. The following day, we went ashore again to take a better look at Loltong village. What I like about this village is that the kids are more precocious than in other places. Whereas in most places we’ve been the kids look shyly from afar, in Loltong, each time we beached the dinghy, a little posse of cute partially-clad kids would crowd around. They played an impromptu game of tag, with me constantly being “it”. They also took to shooting us with little seeds blown out of hollow papaya fronds. 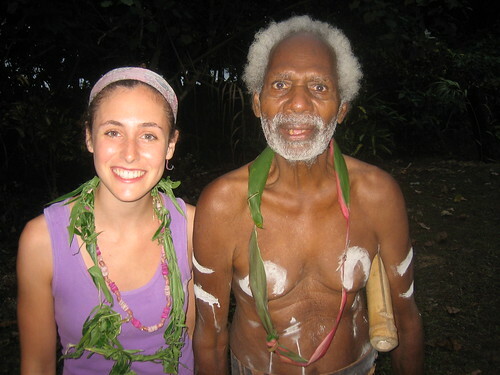 We walked around the village and met the paramount chief, William and his wife, Beth. 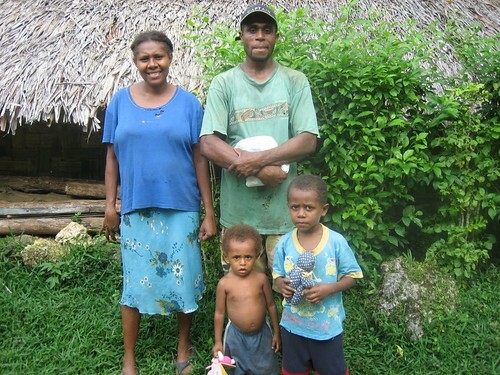 They were a very friendly couple, with kids who have moved away to become doctors and businessmen in Fiji and the US. Afterwards, we took a longer, steeper hike up a path that climbed up a ridge overlooking the bay. We met a 75-year-old woman, truckin up the path in flip flops, twirling an umbrella to keep the sun off her face. 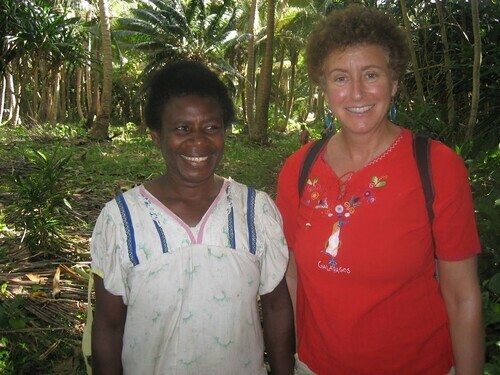 She turned out to be extremely outgoing and sweet, the wife of chief Richard, and she talked and laughed with Mom and I all the way up the extremely steep path (which, by the way, she walks up every day, nearly an hour each way, to tend to her vegetable garden). After a while we bade her farewell, and headed back down. Laura is taking over now – poor Hannah is tired. It is 7:00 P.M. and this is about the time she starts to fade here. Too much heat and too much sun! Anyway, to continue the saga, on the edge of the village we met Jeffrey, a very warm and friendly man whose father worked for the U.S. navy during WWII. Jeffrey was very positive about America and was disappointed to hear that we were leaving the next day. Just a few minutes later we met his son, Dickie, as warm and hospitable as his dad, who offered us fruit to take back to the boat. He climbed up the tree next to his house and started tossing pamplemousse down to Mark. He apologized for only having a small bunch of bananas and a single papaya for us (in addition to all the pamplemousse he had just picked for us). Luckily we had brought along some gifts in our backpack and could repay him with children’s clothing and books (for his two sons). 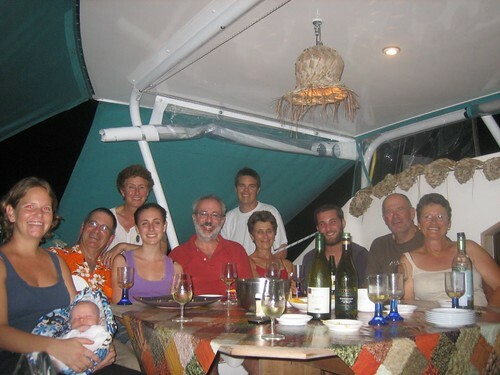 That night we had made arrangements to have dinner prepared by a local woman and listen to a string band. When we came to the village in the evening (with our friends from the two other boats), we found that the string band had been called away to play at a funeral in the village up the hill. Dinner, however, was still on, and we were greeted by songs and smiles by Mary (our cook for the evening), and several village children. It was a terrific dinner – with all sorts of local dishes – and continuous singing by the children. Some of our favorites were “Satan is the loser man” and “We are one big family”. The kids were just so pleased to be singing all their Sunday school songs for us that they didn’t want to stop singing, even when we all said, it was fine for them to go out of the little hut where we were having dinner. The next morning we left very early to make the 55 mile run to our next anchorage on the island of Espirito Santo. It was a totally windless day so we had to motor, but it was sunny and pleasant. We sailed past the island of Ambae which has a huge volcano on it. We wanted to stop there for a night or two, but we had to keep going as Hannah leaves so soon. We arrived in Peterson Bay, Espirito Santo at 4:00 p.m.on Friday, bumping lightly into a coral head as we entered the anchorage. It is a beautiful place, but somewhat unprotected in the outer anchorage. There is a terrific protected anchorage just around the corner with a small resort, the Oyster Island Resort, that we will move to tomorrow at high tide. The pass to get in is just a few inches deeper than our boat at high tide so timing is important if you don’t want to get stuck. 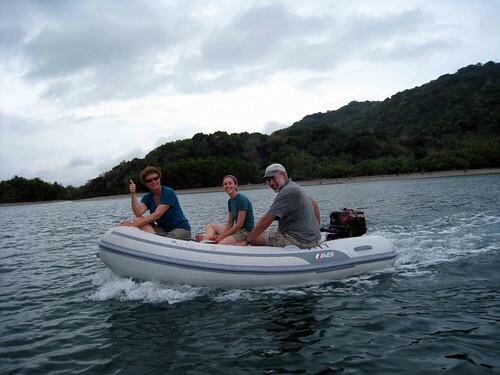 July 18: Collin, and his wife Mary, the owners of the resort, came out in their skiff to guide us through the narrow and shallow pass into the inner protected anchorage in front of Oyster Island. It was a bit nerve-wracking and we went through with only a few inches of water between us and the bottom. It is such a terrific anchorage, totally protected from swell, but with a nice breeze. The resort is very small (8 bungalows) and extremely low key. We went there for dinner and ended up sitting with Collin and Mary, and Collins father who is visiting from New Zealand. It was a lot of fun. They are sailers, and just have this resort as a kind of hobby. They also have a farm in New Zealand (where they raise sheep) as well as run a vineyard. There is still a lot to write, but now it is Monday morning and Hannah leaves tonight so we are off to organize her trip to the airport. It’s Hannah, here, reporting to you from Banam, a lovely, wide bay in eastern Malekula Island. We arrived here two days ago after a smooth sail from the Maskelynes. Despite the gentle weather on Saturday, a low pressure system brought thunder, high winds, and sky-illuminating bolts of lightning the night before. Fortunately, our anchorage, nestled between two very green, lush islands, kept us protected. After setting anchor in Banam, I inflated the kayak– first riding with Mom, then with Dad. As the sun set– one of the most magnificent I’ve seen yet in Vanuatu– Dad and I met some young boys heading out on wooden canoes to the reef to catch Longmouth (aka Barracuda, the same fish we ourselves caught and ate earlier this trip…yum). The next day we took the dighny out to a reef that extends from the edge of the bay to check out the snorkling. As we swam up to the drop-off, falling from 2 to nearly 100 feet, I almost chickened out and headed back to the dignhy. Even with the reassurance of our guide books and of the locals that there are only “nice” sharks here, I must admit that I find it of little comfort when actually faced with a bottemless blue abyss. But I couldn’t bear to wimp out in front of my fearless, seafaring pirates… I mean parents. So I forged ahead, and the beautiful coral and vibrant sealife, including a very bizzare looking cuddle fish spotted by Dad, made it worth pressing on. I did see two sharks slinking gracefully along the coral, roughly 6 feet each. Go figure.Two other boats who had been at the Maskulyne anchorage with us, Flame from Australia and Kaitorete from New Zealand, sailed into Banam Bay in the afternoon. Kaitorete had caught a giant yellow fin tuna just a few hours before, and were nice enough to give us a huge hunk of it. We seized upon it as soon as we got back on board, eating half as sashimi, and half quickly seared with olive oil and ginger. Unbelievable. Saturday night we had Kaitorete and Flame over for sundowners, along with Steve from Irony, who came in after us on Saturday. It was a very lively gathering, and I spent most of the evening playing with the two adorable kids from Kaitorete, 4-year-old Megan and 7-year-old Matthew. This morning, two young men from the village brought us 3 lobsters (actually, crayfish, to be precise), a sack of lemons, and a bunch of bananas. The lobsters were huge, and made for another fresh and delicious lunch. Before that, Mom and I worked up our appetites by swimming out to meet the kids and Annabelle from Kaitorete, and Diana from Flame, who were puttering around the coral bommies near the shore, spotting fish. In the early afternoon, a young boy came by, carrying a guitar in his canoe (which he somehow managed to keep meticulously dry). Masint is 18 years old with very good English and the sweetest, most genuine smile. After a few minutes of chatting he came aboard so he could play some songs for us on his guitar. 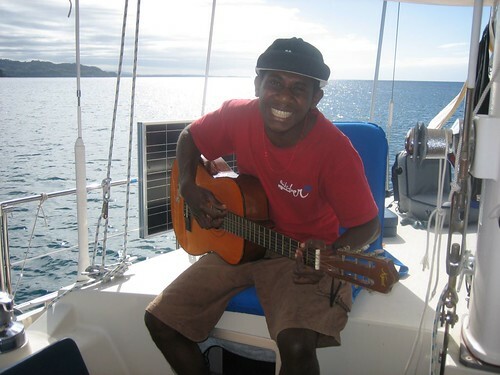 He performed three songs in Bislama, played guitar very well and sang with enormous enthusiasm. Mom and Dad gave him one of the MP3 players they had loaded with reggae and Vanuatu “string band” music. He was very pleased. “Nambawon!” he kept thanking us, always with a thumbs up and a broad smile. 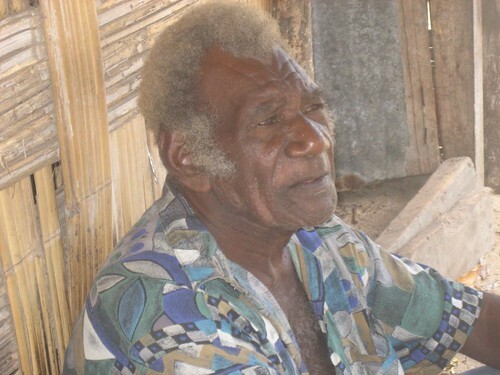 Chief Saitol, founder of the Hefah Sar Culture Club here at Banam Bay, is an 85 year old, white-haired, big-bearded and charismatic chief– a legend among cruisers. He organizes performances of the village’s traditional Kustom Dances for visiting yachties. We organized with Chief Saitol to see the dancing Monday afternoon, and headed to shore with Kaitorete, Flame and Irony. As we distributed a bag full of cell phones, which the villagers had asked us to charged on our boats (no cars, no electricity, but everyone has a cell), two German boats sailed into the bay just in time to join us for the performance. 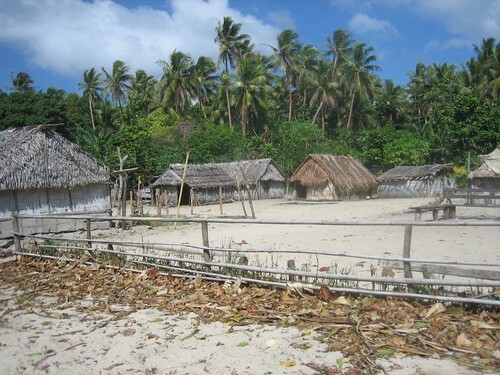 The villagers of Banam Bay belong to the greater Malekula tribe of the Small Nambas, distinct from the Big Nambas, their former rival tribe. And in their traditional costumes, consisting of a strategically-placed banana leaf, whether or not they are in fact small or big nambas is really for each to judge. 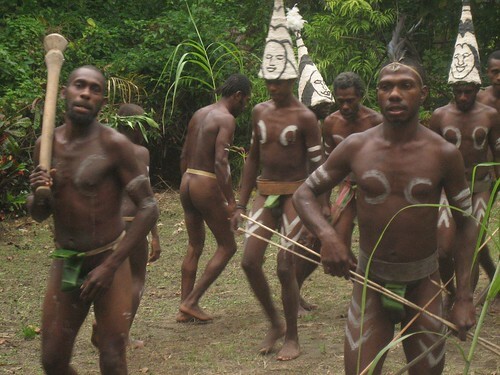 About 15 male dancers so attired performed rhythmic steps to the beat of percussion instruments played by Chief Saitol and two other older men, who sang together in chorus. Lucky for me, I got to hold hands with my new friend Megan almost the whole time. Afterwards, women, ranging from children to grandmothers, performed a female Kustom Dance, wearing their traditional grass skirts. At the end of the event, Chief Saitol gave effusive thanks to the sailors for coming, and implored us to tell our friends in American, NZ, Australia, and Germany to come see his village…”Boost tourism!”. We finished with a sort of mini feast: a fresh coconut for each person to drink and a big spread of laplap, the traditional dish of flattened and fried manioc (or breadfruit) and meat, in this case chicken. Although the event was definitely a tourist attraction, given that the villagers would typically only perform the Kustom Dances at special occasions during the year, it still felt authentic and very much Vanuatan. It’s the following day now, Tuesday, and Sabbatical III is safely arrived in Loltong, on Pentecost Island. Phew! We left at 6 am this morning from Banam Bay, and had a whooper of a sail, averaging 7 to 8 knots the whole way. We were feeling great, approaching our destination 2 hours earlier than planned, when a nasty squall decided to park itself over us and Pentecost, effectively blowing straight out of the mouth of Loltong bay. With the rain driving right into our faces, and the wind howling at 25-30 knots, there was no way to make out anything, let alone the markings that supposedly indicate the safe entrance through the reefs. Moreover, Loltong bay, like much of Vanuatu, has not been well charted, so we could not rely on nautical charts. Just as we were about give up any hope of entering safely, thinking instead we would continue on to another island where we hoped conditions would be milder, Midnight Sun, a boat anchored in Loltong, offered to guide us in via VHF radio. Following his instructions, we safely approached the narrow break between two reefs that flank the sides of the bay. Now that we are anchored close in to shore, it is hard to believe it is blowing so hard just a half mile out. This anchorage is unlike any other I’ve seen here: the water is glassy and deep aquamarine, reflecting the green hillside that drops sheer down to the water and encircles the bay like a towering, vine-covered ampitheater. There are frequent rainbows, including a fantastic display that showed clearly against the hillside from end to end. After a random assortment of snacks and water-guzzling all around, Mom and Dad have collapsed into their front berth for a very well-deserved nap. And now let me say what Dad would never say about himself: he is an outstanding captain. He is competent, responsible, and ready for anything that the sea, wind or weather might bring. Thanks Dad! We are now anchored off of Awai Island in the Maskelyne Islands, a group of small islands that lie to the southeast of Malekula. As predicted, the wind shifted to northwesterly from southeasterly during the night (at 5:05 am to be exact since the 180 degree turn of the boat set off the anchor proximity alarm). When the wind has west in it, anchorages on the west side of islands become uncomfortable and possibly dangerous. So we set off for Awai which is nestled between three islands and is pretty much protected from all directions. As this is Laura’s birthday, I promised to catch her a tuna. This put a lot of pressure on me, but I was able to deliver 5 1/2 hours into our 6 hour sail. The tuna was quite small but tasty. Hannah made pina coladas and we toasted Laura as the rain pelted outside accompanied by flashes of lightening. Yesterday we did not do much. Hannah needed to rest after our kava drinking, so Laura and I did a short snorkel at Ten Stick Rock. Later in the afternoon, Rita and Solomon and four of their children paddled out in their outrigger canoes to visit us. We befriended them last year and we were all happy to get together again. They brought us another load of fruit and we had special gifts for them that we brought from the States. We chatted in the cockpit until the sun was about to set. Right after they left, Scott, the son of the “Lamangoe” ranch owner who was so hospitable to us the previous day,and his pal, also named Scott and also from New Zealand, came to Sabbatical III for sundowners and snacks, as did Jim of Cardea. We had a great time with them, sampling various non-kava beverages, among them the “Q. F.”, a drink whose full name cannot be spelled out in this blog. 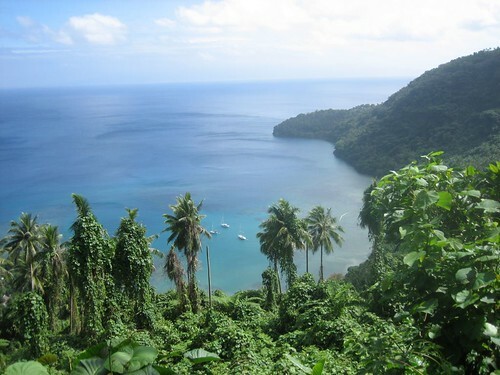 We will probably head up to Banam Bay on the east coast of Malekula tomorrow, weather permitting. Since our last blog we spent a couple of very quiet, but nice days in the anchorage near Dixon Reef, and then sailed down to Southwest Bay yesterday. Dixon Reef turned out to be an amazing place for snorkeling. The reef is very expansive, with gorgeous coral formations and tons of colorful fish. For a while we just kept seeing lots and lots of beautiful, but small fish, but then we were rewarded by seeing a large school of bumphead parrotfish. They look just like the name would indicate – huge fish (up to 4 feet long), with a tremendous long face topped by a great big bump. They look more like a cartoon than a real fish. They travel in schools and we happened upon about 10 of them feeding on the reef. They let us follow them for quite a long way. It was a real thrill. We also saw a few white tipped sharks and a sea turtle. The village of Dixon Reef is not near the anchorage so we did not have much interaction with the locals, except on Sunday when we walked to town. The anchorage was beautiful, but a bit uncomfortable as it was not well protected from the ocean swell. The only other boat there was Cardea, with our friend Jim on it. We have just spent our first day in Southwest Bay anchored outside the village of Lembinwen. We were here last year and enjoyed it very much so we wanted to bring Hannah here. We have had quite an adventure today. 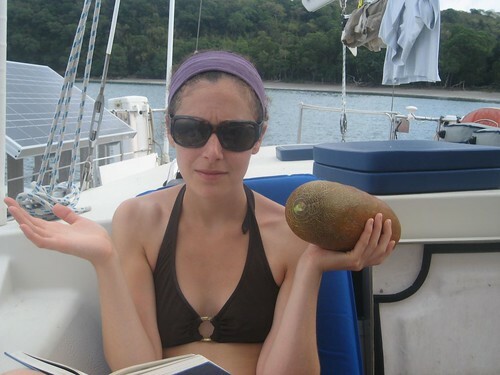 As a matter of fact, Mark and Hannah left the boat an hour ago to go drink kava on the beach with the locals. It was a rainy day and we almost did not leave the boat this morning, but I am so glad we did. First we went to the village where we walked around and met some of the villagers. People here are friendly, but extremely shy. A few people remembered us from last year. There is a small river that runs by the edge of the village and empties out into the ocean and on the other side of it there is a very large ranch owned by a New Zealander. The ranch has sheep, goats, cattle, chickens and a few riding horses. It is very large, covering over 200 acres of land, and it has the only western style home on the island as far as we can tell. We had caught glimpses of the lovely ranch from the water, and had even visited the grounds last year, although the owner was not in the country at that time. The ranch sells their beef to markets in Vanuatu, exports some to Australia and New Zealand, and gives away a lot to the villagers. This time, when we went to visit, we were very lucky, as the owner’s 22 year old son was there. When we walked up to the house we saw him and a few other white boys near the shed where they process and store meat and eggs. We went to say hello and realized they were right in the middle of butchering several goats. There were severed heads and entrails sitting in a huge pile on the ground, and a lot of blood. to build a ranch here and now lives here about one quarter of each year. Scott explained to us that a client of theirs had just put in an order for 10 goats and so they were in the process of killing and butchering the animals just as we arrived. It was not a pretty sight, but extremely interesting. Scott slung a rifle with a scope over his shoulder and we followed him out to the lovely meadow where the goats were grazing. He felled three more goats with a single shot between the eyes (from 50 meters) as we watched and then two of his friends ran out and slit their throats (anyone hungry yet?). It does sound kind of horrible, but it really was so interesting. 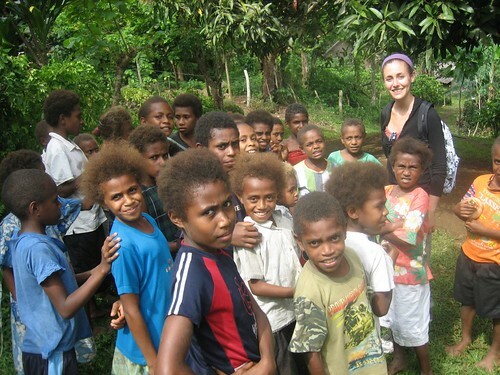 Two of Scott’s friends are young New Zealanders who are in Vanuatu teaching English to some of the kids in the next village over (about a mile away). Another of his friends is an engineer who comes out to Vanuatu once a year or so to repair equipment on the ranch. Scott asked if we would stay and have lunch with them. It was a hard invitation to refuse. The home is not ostentatious, but is very lovely, with a huge veranda overlooking the bay, the palm covered hills, and the beautiful water. Small outriggers paddle back and forth across the bay with fishermen. All of the local people love Scott and his family because they are apparently quite generous and are continuously doing things for the villagers – including paying for the rebuilding of an entire village after a hurricane several years ago, giving away meats and eggs, and employing many of the locals on the ranch. Scott insisted on preparing lunch for all of us – 7 guests in all. He grilled meat (of course), prepared potatoes and salad and bread (baked by a local woman) and insisted on giving us several steaks to take back to the boat with us. 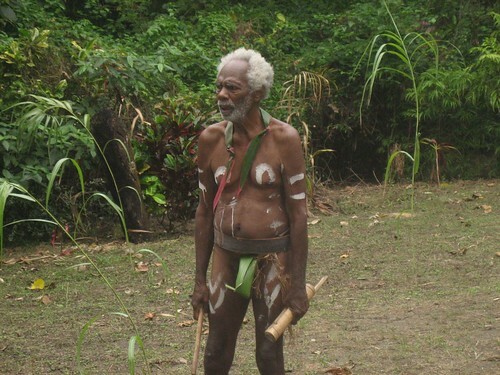 Then he asked us to meet him in the village to drink kava at his favorite kava bar. Mark and Hannah and Jim all went – but I was too exhausted to leave the boat. Hope they get back soon so we can hear all about it! This is Mark now, just back from 2 1/2 hours of “kava crawl” though the kava bars (nakamals) of Lembinwen village. This village of 300 persons has 6 nakamals. The first nakamal Hannah and I visted was in a thatched hut and the second (“Gideon’s”) was outside a hut (the rain had stopped) further from the beach. We sat on plain wooden benches. 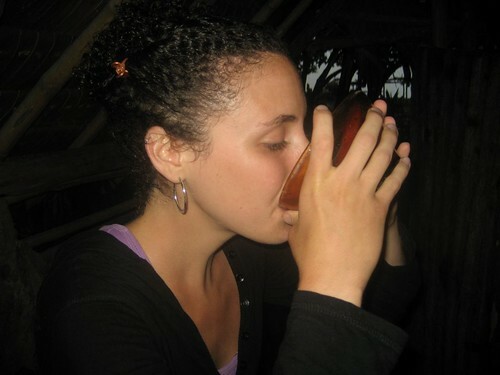 One typically drinks kava standing up, taking the whole portion without taking a breath, and then spits afterward either onto the dirt floor of the nakamal or outside. We were with Jim of Cardea, the four Kiwis, and two Vanuatans who work on the ranch. It was very mellow and Hannah and I had several cups of kava over two hours. Kava makes conversation easy and makes it comfortable to just hang around in the nakamal being thoughtful, or at least that is the perception. The kava drinking was still in full swing when Hannah and I left for the boat but we thought Laura might be worried about us. I ran into Solomon whom we know well from last year and invited him and Rita, his wife, to visit us in the mid-afternoon tomorrow. At five in the evening, we will have our Kiwi friends and Jim over for beers and snacks. So our social schedule is quite full, in spite of the rain. We are now anchored at Dixon’s Reef on the west coast of Malekula Island. We arrived here yesterday afternoon after a 4 hour passage from Millipe. We spent our last full day at Millipe snorkeling, reading, and talking with local people. We were presented with even more pamplemousse, coconuts,bananas,passion fruit, and papaya. So much that its consumption seems impossible. An hour after arriving in Dixon’s Reef, we got a radio call from our friend Jim on Cardea who had just anchored in Southwest Bay, 8 miles to the south, after a trip from Epi Island. He picked up anchor and came up to join us in Dixon’s Reef. There are no other boats here nor did we see any others in Millipe on on our passage north. 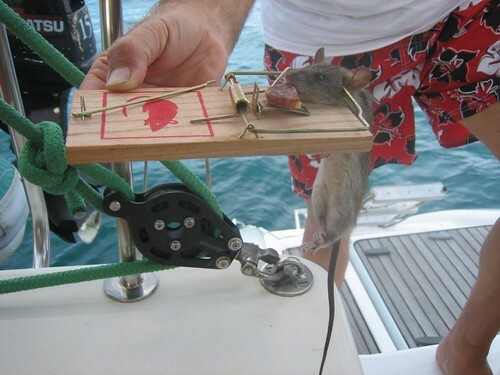 Jim came over for a fresh fish dinner. I caught a strange looking fish just outside the reef on the way in. It was long and thin, with a very elongated mouth full of many sharp teeth. To be sure it was safe to eat, I took a photo of it’s head and brought it to shore where we met a local man loading wood onto his dugout. He said it is a “longmouth” and was perfectly safe to eat. My kava buddies in Millipe had said that they ate “longmouth” but I did not know what that looked like. Today we will snorkel on the reef. The water here is very clear. The seas are way down and the sky is almost cloudless, so it should be a great day to see the coral and fish. The location of Sabbatical III is S16 degrees 21.011 minutes E167 degrees 22.968 minutes. In the morning, a man paddled by with a canoe laden with wooden planks. I learned he was chief WIlliam of Tomman Island. We told him we’d be there shortly, and he said there would be activities for us to see on shore, including a football (soccer) match, and a man with a long head. One of the reasons Dad was keen on coming here was to see the “long-heads”, as they’re called, an old tradition of elongating childrens’ heads that was stopped by the missionaries. -At their lovely, flower-filled compound, William took out a clay bird, made by an elder family member, and dictated the village creation myth while a daughter translated into French. According to the myth, 5 brothers in Millepe sent a bird to kill a large clam in the ocean. The bird planted a tree in the clam, from which Tomman Island grew. 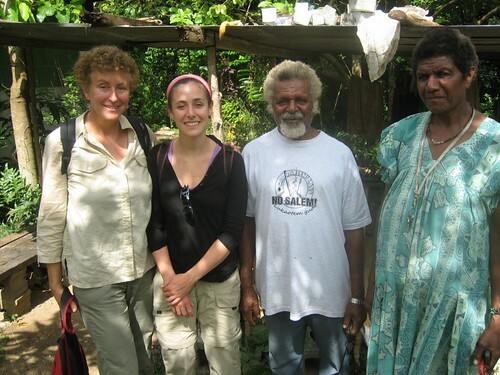 -WIlliam and Annie guided us through the village, showing us water sources, a primary school, churches, and the dance ground for the island’s traditional ritual dances. Only members of Chief William’s family can dance, and they do so to the drumming of large tamtams, a special kind of Vanuatan drum. -Evidence of a confused colonial history: Although they are right across the bay, young people in Tomman Island speak French while people in Millipe speak English. Even crazier, in Tomman, the older generation speaks English while their kids speak French. -I talked a lot (in French) with a young girl named Marilyn. Since neither of us speak French very well, there was a lot of miscommunication, and just nodding and smiling. What we did understand we high-fived to– figuring out we are both the same age, both un-married, and both prefer the village life to Port Villa, the capitol. -Annie told an interesting story about the “Hidden Time”– what they call the period in thier history before missionaries arrived. In the hidden time, people from other villages would often come and kill women and children in Tomman, so the village moved. “Then we learned about God”, Annie said, “and now, no more” she shaking her head. – They took us to see the last remainining long-head, an old man with what seemed to be an especially accentuated forehead. This used to be done by binding the heads of babies. He claimed to be 95 years old, born before missionaries and before WWII, during which he worked with the US Navy. He had a full head of hair, and a toothless smile. -Finally we came to the village’s big sports field, ringed with palm trees. Today was the football match between Tomman and Southwest Bay, and everyone was out cheering, including fans from Southwest Bay and Millipe. -Girls were playing volley ball on a court next to the field, and although no one was watching, they were pretty good!